Quebec and Quincy are synonymous…Quincy Guerrier that is. 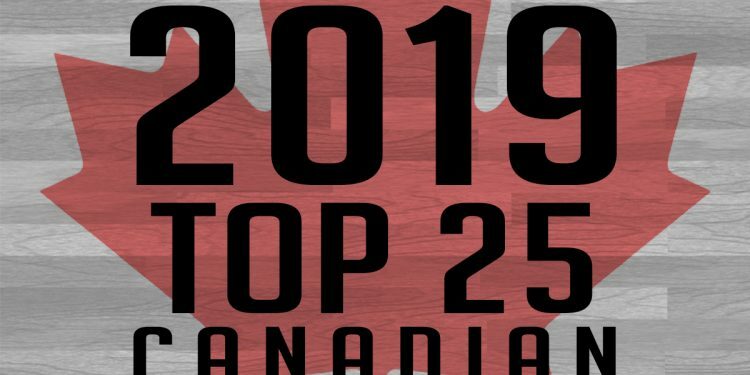 Quebec is well represented yet again in the pre-season release of North Pole Hoops Top 25 National Player Rankings, and is gaining on Ontario as a powerhouse producer of Canadian talent. While the Top 100 has representation from all over Canada, the Top 25 remains dominated by the likes of Ontario and Quebec. Guerrier is carrying the torch for this year’s graduating class of 2019 Canadian prospects. He is fresh off of visits to Oregon and Syracuse and is taking one more for sure to Illinois with the possibility of a fourth to Maryland. Guerrier visits Illinois October 5th. The Canadian wings in 2019 are coming in strong. Many of them have shown versatility on both ends of the floor and as a result are building a premium for themselves. So far over 30 NCAA coaches have come in to Canada in the pre-season and there are more creating schedules into October and during the regular high school and prep season. Based off of patterns the Top 50 of each Canadian class goes on to play either at the D1 level of the NCAA or at a high level in Canada in the USports league. Guerrier is in a unique situation as he’s expected to be on campus somewhere in the NCAA in January for second semester. He will graduate from Thetford Academy in December, but a college decision will come well before then. Through dialogue with Guerrier, he expressed that he will be making a decision mid-late October. Playing time, who’s going to be there already at my position, the relationship I have with coaches…ultimately the best fit. These are the factors that will help him come down to a decision. This High Major prospect put emphasis on the relationship with the coaching staff. Oregon and Illinois seem to be the ones with the best relationships. It’s a step by step process but my immediate goal is to come in and not have any drop off as a freshman. I’m a little more experienced than most freshmen so I’ll be ready. Joel Brown – OFFERS – Minnesota, Seton Hall, Clemson, Cal, Howard, Vanderbilt – Joel will be committing on Tuesday. Marsei is able to weave through traffic and create his own shot. With scorers around him, Caston is a very willing passer and can get it done creatively and efficiently. Shak Pryce has been under the radar for far too long. This lengthy lead guard from Pine Ridge has time and time again proven his worth. Between suiting up for the Pine Ridge, Northern Kings (AAU), earning MVP at the Durham NPH Showcase and training with “Ceddy” at Galaxy Training; he’s shown a consistent sign of improvement by attacking his weaknesses. Most recently, Pryce has added muscle to his frame, which is helping him absorb contact much better than previous years. We love his ability to defend, with his wiry frame and foot speed. When Pryce gets low and in a defensive stance he takes away a lot of angles from ball handlers. Pryce is the type of prospect to use the world potential on because his mental make allows for consistent improvement and at this stage, he’s just scratching the surface. Sabry Phillip is the only committed player in the Top 25 so far. He is currently verbally committed to San Diego by way of Edmonton, Alberta where he had four strong years at Harry Ainlay and now is in his post-grad year at TRC Academy. There are several more commitments coming in the early signing period. Stay tuned and following along for that and more recruiting info and official visits. Miguel Tomley has made his return to Ontario from British Columbia and is looking to tear up this season with his hot shooting before heading to Santa Clara where he has already verbally committed. He has the ability to get hot and score in bunches. At this point in his career he is a straight up 2 guard. He’s well proven in the B. C community and will use this final season as a post grad to test his game against higher competition and get his body physically ready for D1.